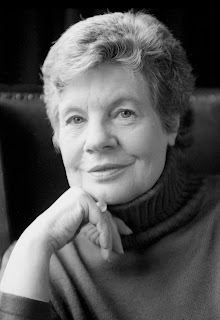 A. S. Byatt was born in Sheffield, England to John Drabble and Kathleen Bloor. She went to Sheffield High School and the Quaker Mount School, then Cambridge, Bryn Mawr, and Oxford. She lectured for several years at London University and University College London. Byatt seems to be mostly a writer, though, having written everything from fiction to poetry to critical studies and essays (with an output in the >20 range). Her pet themes appear to be naturalism, realism, and the places where fantasy intersects with the real world, and I think I’d definitely be game to pick up at least a couple of her novels. Wikipedia quotes her as having said that she’s anti-Christian and doesn’t believe that human beings are basically good, which makes me think that she’s probably awesomely sassy, however she’s also in some sort of feud with her sister, writer Margaret Drabble, over a tea set, which is ridiculous. Byatt had a daughter and son with her first husband (her son died in a car accident when he was 11), and two daughters with her second husband.